The murderer of Iraqi children , the stooge of the World Order , the pet of the UN and of dark Zionist forces who engineered the war on Iraq , the head of the IAEA at the time of the Iraqi war who brought over to Iraq as part of his team the Zionist agents who put on the ground the map of the destruction of the country . One of the main responsible for the Iraqi plight who killed and deformed -in this century- more children than were ever killed and deformed and this due to the report he wrote for the UN on the WMD in Iraq that was confusing enough to give room to different interpretations and permitted the US assault and invasion of Iraq in year 2003. An NGO stooge , former board member until 2012 of the International Crisis Group – ICG- along with Brzezinsky and George Soros of the Open Society Institute which is a very shadowy international organization that meddles with countries’ internal affairs and have an agenda of interference in Syria and other countries . El Baradei is an NGO stooge and pet of the World order member of a major steering group that works for the global elite . A criminal of a high caliber and at a much larger scale than Mursi. The question is : Why Egyptians are doing this to themselves ? While I don’t consider El Baradei to be Egypt’s saviour, there are a lot of accusations made here that don’t exactly jibe with what I remember of the days before the invasion of Iraq. In particular, I don’t regard him as having been the “pet” of the Zioinist neocons. What’s the evidence for this? Also, his having been on the board of the International Crisis Group does not mean he has blood on his hands. Brzezinsky , it should be recalled, opposed the Iraq are, opposes any attack on Iran, and has advocated that the US should shoot down any Israeli plane that tries to bomb Iran. I know or knew one member of the ISG, Joost Hiltermann, who is the ISG’s observer in Iraq, when he was working on Palestnian issues in the late 80s. I have interviewed him about Iraq and read statements of his in the US media and if he has a Zionist bias I would have seen it and called him on it. 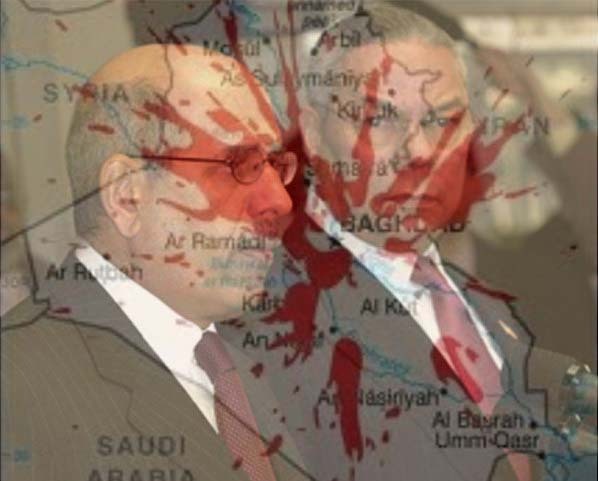 Al Baradei is number one guilty on the Iraqi issue and the report he wrote was not final in denying the existence of the Weapons of Mass Destruction that caused the destruction of Iraq and which were non existent and a lie fabricated by the British and US Intelligence Services . These weapons were fictitious but the destruction of Iraq was real and the disfigured Iraqi children that are born with birth defects are also real .And the destruction of a country and the instigation of ethnical and religious sectarian conflict are also real and the sacking of the resources and of the archeological sites is also real . If we start pleading innocent for all criminals who are responsible for all this God knows where we will end up . It is because of this license and innocence provided for war criminals that these crimes are being repeated in Libya and Syria and elsewhere . El Baradei catered to the western desire for launching a war against Iraq under the pretext that Iraq presented a threat to USA who needed protection after the 9/11 hoax that they did to themselves . Baradei wrote his reports after so many trips of inspection to the Iraqi sites and arsenals and not one corner was left without being searched , These inspections teams included Zionists who worked for Israel and were on a spying mission in Iraq under the pretext of inspection . After that all these trips that inspected everything one could think of , the weapons were not found but the report was not final in denying the existence of such weapons leaving for US officials a margin of interpretation and therefore action which led to all this tragedy . If you think that el Baradei should get away with this there must be something wrong with the way you think. El Barad’i should be tried for sharing in hiding and concealing facts and information that could have saved a country and a people unless you consider Iraqis as dispensable .. As for the ICG I leave it to you to find out what role it plays in destabilizing societies. As for Brzezinski , some Zionists are wiser than others , they will not risk to destroy Israel and are not in a hurry to see it annihilated , they are not less Zionists for this. Brzezinski has not yet repented from creating the group called al Qa’ida .Once he does this he might be acquitted but not before . All these people -including Soros, the Master of false flag revolutions- should be tried for war crimes if one is seeking justice rather than not western hegemony over the world.